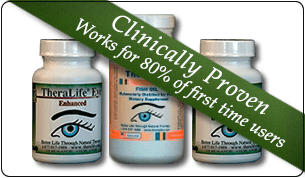 TheraLife® Eye has been clinically proven to work for 80% of first time users. The formula restores and revitalizes the tear secretion glands intra-cellularly in order for the eyes to produce its own balanced, sustainable tears naturally. Your choice for dry eye relief is clear. TheraLife® has the complete solution! What are chronic dry eyes? Chronic dry eye symptoms are burning, gritty, painful, watery, dry, blurry, and light sensitivity. Now you can get relief from your own natural balanced tears. No more drops! Learn more. You may have already been treated with antibiotics, hot compress, eye lid cleansing, and steroid eye drops. Learn more about Blepharitis, Meibomian Gland Dysfunction, and Dry Eye Syndrome. 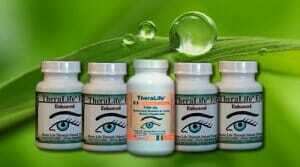 What are the benefits of TheraLife® Eye? Reduces irritation and inflammation of tear glands, eye surface, eye lids. Restores your eyes own natural ability to produce tears. Restores and revitalizes the eye’s tear secretion function. More than fish oil or flax seed oil alone. 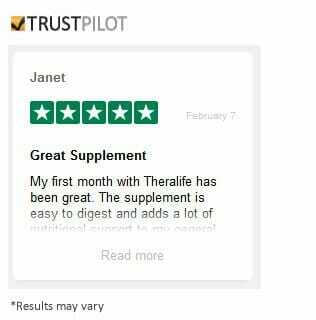 Don’t delay, learn more about how TheraLife can help relieve your dry, itchy and irritated eyes today! Artificial Tears – Application of artificial tears should be limited to no more than 3-4 times per day and can provide temporary relief. A word of caution: frequent use of eye drops can make your eyes drier. Autologous Serum Eye Drops – Autologous serum eye drops contain over 300 components, all of which have been shown to play important roles in the maintenance of a healthy ocular surface. None of the commercially available artificial tear preparations include these essential factors. At least one study has demonstrated that the autologous serum eye drops are more effective than artificial tears in a randomized control study; however, there remains some controversy about the efficacy of this treatment modality. Thick Gel Eye Drops – Lubricating tear ointments can be used during the day, but they are generally used at bedtime because the user typically experiences poor vision after application. They contain white petrolatum, mineral oil, and similar lubricants. Thick gel eye drops serve as a lubricant and an emollient. Application requires pulling down the eyelid and applying a small amount (0.25 in) inside. Depending on the severity of the condition, it may be applied from every hour to just at bedtime. It should not be used with contact lenses. Specially designed glasses that form a moisture chamber around the eye may be used to create additional humidity. Omega-3 Fish Oil – Key Role in Dry Eye Relief – Consumption of dark-fleshed fish containing omega-3-fatty acid is associated with a decreased incidence of dry eye syndrome in women. Early experimental work on omega-3 has shown that it yields promising results when used in a topical application or given in the form of oral supplements. TheraLife provides a molecularly distilled Omega 3 Fish Oil. Blocking Tear Drainage – In each eye, there are two small punctal openings that drain tears into the tear ducts. There are methods to partially or completely close the tear ducts. This blocks the flow of tears into the nose, and thus more tears are available to the eyes. The two methods of blocking tear drainage are: punctal plugs and cauterization. Punctal Plugs: Punctal plugs are inserted into the punctal to block tear drainage. For people who have not found dry eye relief with drugs, punctal plugs may help. They are reserved for people with moderate or severe dry eye, when other medical treatment has not been adequate. Statistically it has been shown that 50% of the punctal plugs fall out within the first year. Cauterization: If punctal plugs are effective, thermal or electric cauterization of puncti can be performed as a more permanent solution. In thermal cauterization, a local anesthetic is used, and then a hot wire is applied. This shrinks the drainage area tissues and causes scarring, which closes the tear duct. This procedure is done only infrequently. Customized Contact Lenses – Persons with severe dry eyes may benefit from the Boston Scleral Lens which is a customized contact lens. Resting on the sclera, it creates a fluid filled layer over the cornea, thus preventing it from drying. Surgery – In severe cases of dry eye syndrome, surgery may be performed where the eyelids are partially sewn together. This reduces the eyelid separation, hopefully leading to a reduction in tear evaporation. This procedure is not done very often, and should be done only in consultation with an eye physician. AskMayoExpert. Dry eye disease. Rochester, Minn.: Mayo Foundation for Medical Education and Research; 2014. Dry eye. American Optometric Association. http://www.aoa.org/patients-and-public/eye-and-vision-problems/glossary-of-eye-and-vision-conditions/dry-eye?sso=y. Accessed June 2, 2015. What is dry eye? American Academy of Ophthalmology. www.geteyesmart.org/eyesmart/diseases/dry-eye/index.cfm. Accessed June 2, 2015. Yao W, et al. Dry eye syndrome: An update in office management. The American Journal of Medicine. 2011;124:1016. Stevenson W, et al. Dry eye disease. Archives of Ophthalmology. 2012;130:90. Shtein RM. Dry eyes. www.uptodate.com/home. Accessed June 2, 2015. Dry eye syndrome Summary Benchmark — 2014. American Academy of Ophthalmology. http://www.aao.org/summary-benchmark-detail/dry-eye-syndrome-summary-benchmark--october-2012. Accessed June 2, 2015. Rand AL, et al. Nutritional supplements for dry eye syndrome. Current Opinion in Ophthalmology. 2011;22:279. Facts about dry eye. National Eye Institute. http://www.nei.nih.gov/health/dryeye/dryeye.asp. Accessed June 2, 2015. Yanoff M, et al., eds. Dry eye. In: Ophthalmology. 4th ed. Edinburgh, U.K.: Mosby Elsevier; 2014. https://www.clinicalkey.com. Accessed June 2, 2015. Skalicky SE, et al. New agents for treating dry eye syndrome. Current Allergy and Asthma Reports. 2013;13:322. Toyos R, et al. Intense pulsed light treatment for dry eye disease due to meibomian gland dysfunction: A 3-year retrospective study. Photomedicine and Laser Surgery. 2015;33:41. Marcet MM, et al. Safety and efficacy of lacrimal drainage system plugs for dry eye syndrome. Ophthalmology. In press. Accessed June 2, 2015. Eye disorders. Natural Standard. https://naturalmedicines.therapeuticresearch.com. Accessed June 2, 2015. Castor bean. Natural Medicines Comprehensive Database. http://naturaldatabase.therapeuticresearch.com. Accessed June 2, 2015. Rocha EM, et al. 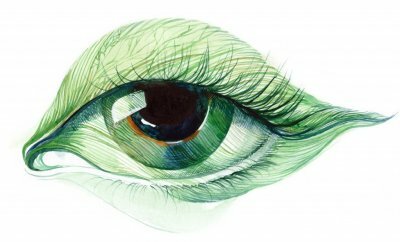 Hormones and dry eye syndrome: An update on what we do and don't know. Current Opinion in Ophthalmology. 2013;24:348. Omega-3 fatty acid. Natural Medicines Comprehensive Database. http://naturaldatabase.therapeuticresearch.com. Accessed June 3, 2015. Vitamin A. Natural Medicines Comprehensive Database. http://naturaldatabase.therapeuticresearch.com. Accessed June 3, 2015. Finis D, et al. Evaluation of an automated thermodynamic treatment (LipiFlow) system for meibomian gland dysfunction: A prospective, randomized, observer-masked trial. Ocular Surface. 2014;2:146. Robertson DM (expert opinion). Mayo Clinic, Rochester, Minn. June, 12, 2015. Zouboulis CC, et al., eds. A treatment strategy for rosacea. In: Pathogenesis and Treatment of Acne and Rosacea. Berlin Heidelberg: Springer-Verlag, 2014. Preferred practice pattern: Dry eye syndrome. San Francisco, Calif.: American Academy of Ophthalmology. http://one.aao.org/CE/PracticeGuidelines/PPP_Content.aspx?cid=127dbdce-4271-471a-b6d9-464b9d15b748. Accessed June 14, 2012. Sign up for the TheraLife Newsletter and get 9 Simple Tips for Dry Eye Relief!